Sarah Nader- snader@shawmedia.com Matt Zissman, welder and fabricator, works on a truck at Henderson Products in Huntley Monday, Oct. 31, 2016. The truck manufacturing company relocated from Gilberts to Huntley in June. 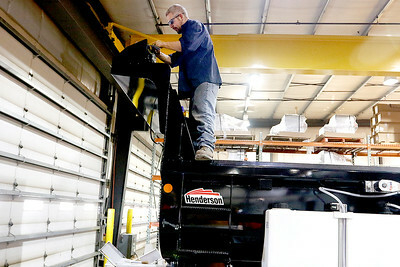 Sarah Nader- snader@shawmedia.com Dan Zambrano, installation technician, works on a truck at Henderson Products in Huntley Monday, Oct. 31, 2016. The truck manufacturing company relocated from Gilberts to Huntley in June. Sarah Nader- snader@shawmedia.com Thomas Capiga, installer, works on a truck at Henderson Products in Huntley Monday, Oct. 31, 2016. The truck manufacturing company relocated from Gilberts to Huntley in June. Matt Zissman, welder and fabricator, works on a truck at Henderson Products in Huntley Monday, Oct. 31, 2016. 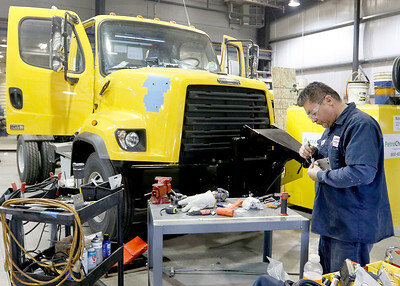 The truck manufacturing company relocated from Gilberts to Huntley in June.